Well, I am not passing totally, at least not yet. I have been very busy, dawn to dusk kind of thing, working on a whole series of video interviews for the Michigan Music Project. It is coming along slowly but surely. A diversion, but a pleasurable one is time spent with my granddaughter Iris, who has been here a couple of times lately with mom and/or dad. She is doing so well after her operation and is such a joy to see and spend time with. And she loves her grandma and grandpa. Of course, I do all kinds of foolish stuff to get her attention, but she is cool with that. That is what grandpas are for, after all. I never knew that grandkids were so addictive. I miss my other grandkids and wish they could visit more. I did talk with Emma on the phone and she is having her first Christmas at home with her mom and dad. That's about it. 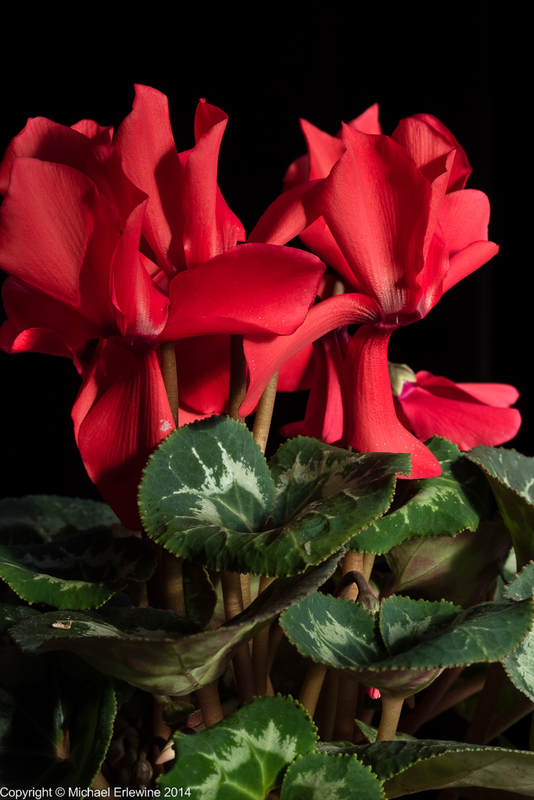 I grabbed enough time to photograph this Cyclamen, one of my favorite flowers. Otherwise, as mentioned, it has been very concentrated work for me editing video. If any noteworthy thoughts arise, I will post them here. Otherwise, it is straight on till morning.